The Stephen M. Ross School of Business offers students a unique educational opportunity to combine theoretical and experiential learning. A broad range of over 40 entrepreneurial and venture capital electives provides students with instruction on the formation, financing, and management of ventures, as well as special topics, including urban entrepreneurship, turnaround management, franchising, legal, and social impact aspects of entrepreneurship. The diverse faculty, composed of academics and proven leaders in the entrepreneurial community, prepare students in their areas of interest. Zell Lurie Institute staff members are available to counsel students and alumni on their business concepts, startup issues,new venture growth, or any other entrepreneurial concerns. Request your appointment today! The course overviews relevant business writing principles giving participants an opportunity to complete entrepreneurial documents including personal biographical statements, product descriptions, industry overviews, value propositions, target market analyses, and mission statements. Participants also evaluate business plans and solicitations for funding. An introduction to legal options available to protect intellectual property, including international aspects of intellectual property law. In this capstone course, students learn and apply powerful frameworks and methodologies that are useful not only for planning and launching entrepreneurial ventures, but for corporate new-business-development and new-market-entry as well. Real-world lessons from entrepreneurs and investors are supplemented by a semester-long team project that entails each 4- to 5-student team researching and developing a business plan and investor presentation for a different startup business concept, with the professor's coaching. Continuing a Legacy: Leading a Family Business --- This course explores the strategic, operating, financial, legal, family, career and business issues found in family-owned and managed companies or privately-held firms. The challenge of the course is to provide the tools to be successful, whether as part of a family business, work for one, or want to be a consultant to a family business. This course is a pragmatic, "real-world" orientation to entrepreneurship through acquisition of a company. Many entrepreneurial oriented managers find that their skills are best utilized in the context of an acquisition and running of an existing firm, rather than via the start up of a new venture. This course addresses the range of relevant topics; acquisition restructuring, and the LBO search fund. This course covers venture capital market structure and institutional arrangements and the application of financial theory and methods in a venture capital finance setting. It presents and applies the fundamentals of venture capital finance, employing "live" case studies to focus on financing startup and early stage, technology-based firms. This course presents the fundamentals of private equity finance, focusing on financing mezzanine deals and buyout transactions. The course covers the private equity and buyout market structure, institutional arrangements and application of financial theory and methods in a private equity and buyout setting. The course covers four main aspects of private equity mezzanine investment and buyout transactions: valuation, deal structuring, governance, and harvesting. This live broadcast of a 7-week seminar speaker series hosted by the Haas School of Business University of California explores why and how microfinance operations have grown to proved financial services to poor and low-income people on a sustainable basis. The class brings together advice and best practices from successful practitioners and institutions around the world as well as new technology startups targeting the industry. Cross-cultural Negotiation and Dispute Resolution --- The ability to negotiate effectively is essential to business success, especially in a global economy. This course emphasizes negotiation strategies and skills that enable managers, functional specialists (for example, in finance, marketing and accounting), consultants, entrepreneurs and others to create and claim value in a manner that enhances long-term business relationships. Among the specific topics in the course are legal and ethical frameworks for negotiation, psychological tools that enhance negotiation effectiveness, and negotiations strategies for dispute resolution (including the use of third party processes such as mediation and arbitration in resolving business disputes). Because the course is offered in an international setting, special emphasis is placed on cross-cultural negotiation and dispute resolution. Included in this cross-cultural experience are: (1) negotiations with local students; (2) feedback provided from and given to your negotiating counterparts regarding your negotiation strategy and tactics; (3) interviews of locals and using a cross-cultural assessment tool, and (4) sessions with local managers, entrepreneurs and government officials. Entrepreneurial Management --- Entrepreneurship is about overcoming ambiguity, risk and failure, embracing it, and learning from it. This course will explore entrepreneurship and identify and many contexts in which entrepreneurship manifests, including start-up, corporate, social, and public sector. It will prepare students for starting and succeeding in an entrepreneurial venture. The main course deliverable is a complete business plan and a presentation to an outside group of investors. This course will enable participants to sharpen their ability to find and evaluate opportunities for a new venture, as well as to think creatively and solve problems in highly unstructured situations. A broad range of topics essential to entrepreneurial ventures will be covered, including idea generation, feasibility analysis, raising capital, marketing strategies, financial modeling, attracting a capable team, creating a culture, and preparing for growth. In addition, the course will cover buying a business, franchising, and family business. Introduction to Entrepreneurship --- Introduction to Entrepreneurship is designed for sophomores and juniors, including non-business students, who wish to learn about entrepreneurship, its role and importance in our society, and how to bring new ideas to marketplace both in the startup and corporate setting. This is an introductory course intended to provide students with a solid foundation on how entrepreneurs and entrepreneurship play a key role in the 21st century global economy. In the course, we will assess, explore, and critique the world of entrepreneurship. Entrepreneurship is approached as a way of thinking and acting, as an attitude and a behavior. Our emphasis is on entrepreneurship as a process that can be applied in virtually any organizational setting. The principle focus will be on the creation of new ventures, the ways that they come into being, and factors associated with their success. This is a course of many ideas and questions, and you will be encouraged to develop and defend your own set of conclusions regarding each of these issues. This course mixes theory with practice, and you will be challenged to apply principles, concepts and frameworks to real world situations. Mobile Innovation Development --- Mobile platforms have emerged as the preferred vehicle for delivering business innovation to consumers. BBA students specifically those with interests in entrepreneurship or career interests in mobile businesses, need to understand the unique requirements of mobile businesses to successfully design, develop, deploy and manage business innovations. This course is designed to help students conceptualizing, designing, developing, delivering and managing technology solutions by taking them through the application (app) development process covering the full spectrum from identifying customer needs to prototyping/simulating a mobile innovation solution. Students will learn business issues related to mobile businesses including business and revenue models, customer engagement through gamification and personalization, security and privacy challenges, role of big data and mobile analytics, and integration of emerging technology directions such as wearables, smart devices, loT, location based features and Social Media Integration. The course will seek to organize students in project groups with a combination of business, design and technology expertise. Project groups will then conceptualize, design and prototype/simulate a mobile business innovation throughout the course. Negotiation and Dispute Resolution --- The ability to negotiate effectively is essential to business success. This course emphasizes negotiation strategies and skills that enable managers, functional specialists (for example, in finance, marketing and accounting), consultants, entrepreneurs and others to create and claim value in a manner that enhances long-term business relationships. Among the specific topics in the course are cross-cultural negotiations, legal and ethical frameworks for negotiation, and psychological tools that enhance negotiation effectiveness. The course also includes negotiation strategies and tactics for dispute resolution, including the use of third party processes (such as mediation and arbitration) in resolving business disputes. Corporate Financing Decisions --- This course develops the conceptual foundation for making corporate financing decisions. Capital structure theory is explained in detail with an in-depth analysis of market imperfections such as taxes, cost of financial distress, agency and informational issues. The next portion of the course covers different securities used to raise external capital with an emphasis on the institutional aspects of acquiring capital (Initial public offerings, seasoned equity offerings, public debt, convertible debt, private equity & venture capital). The causes and effects of financial distress and the bankruptcy process are explained. Payout policy and different payout strategies (dividends versus stock repurchase) are discussed. The course ends with a brief discussion of risk management. Throughout the course, financial theory will be integrated with the use of specific case studies. Base of the Pyramid: Business Innovation and Social Impact --- Business can, and indeed must, play a greater role in responding to society's grand challenges. The deep poverty faced by the Base of the Pyramid (BoP) - the 4-5 billion poorest people on this planet and constituting approximately two-thirds of humanity - presents a challenge on the grandest scale. While donation-based approaches have their place, the promise of achieving both profits and social impact through market-based approaches offers an exciting alternative. Business opportunities in health care, energy, agriculture, sanitation, housing, education, consumer goods, clean water and other impact areas can lead to a more inclusive capitalism. The challenge is to build enterprises that are sustainable at scale in an impoverished and unfamiliar market context. The course integrates concepts of strategy, international business, entrepreneurship, non-profit management, and development to stimulate the leadership skills and competitive imagination needed to design, pilot, and scale BoP enterprises. Emphasizing action-based learning and using carefully selected cases, readings, videos, and outside guests, class sessions focus on: 1)identifying the opportunities and challenges associated with serving BoP markets; and 2) developing a toolkit of strategies, frameworks, and processes for building sustainable, scalable enterprises that create economic and social value. Entrepreneurial Business Basics --- This business basics course covers how to make a product or service idea real in the form of a tangible, marketable product and an organization that can produce and distribute it. Topic areas covered include: motivation and social purpose of entrepreneurship, market research and product development activities, people resource management, capital resources management, and go-to-market management. Entrepreneurial Turnaround Management --- Turnaround management techniques will be examined in this course, led by an experienced practitioner. This "hands on" course evaluates analysis techniques, prioritization of tasks, communication strategies, strategic repositioning, financial restructuring, and the psychological aspects of troubled situations. Financing Research Commercialization --- This course is a practicum, offering an opportunity to apply collective team work of a student/mentor alliance to building a launch pad for a technology-based venture. This course is open to Ross School MBA and BBA students as well as all UM graduate students. 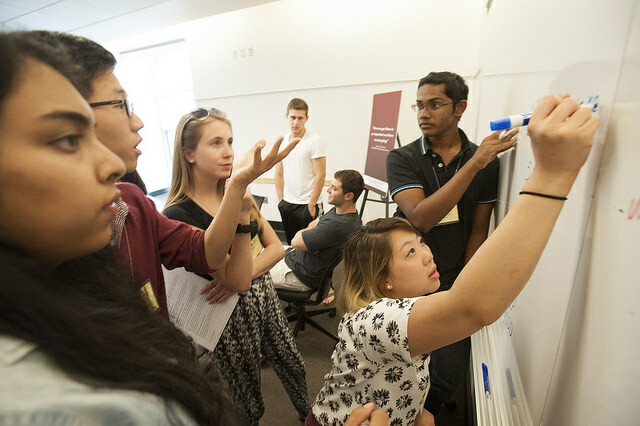 Student teams will work with mentors and principal investigators (PI) from UM faculty in the Medical School, College of Engineering and other divisions to build a business and marketing plan for a new technology or invention. Projects are based upon disclosures made to UM Office of Technology Transfer, other universities and industrial companies. Independent Study Project --- Independent study projects, supervised by faculty, are available to juniors and seniors in good academic standing. To select a study project, students should consult the appropriate professor about the nature of the project and the number of the credit hours the work would earn. One to three credit hours may be earned. Junior and senior BBAs may elect only one independent study project in a term, and no more than three during the BBA program. No more than seven credit hours from study projects may be counted toward the BBA degree. To register for a project students must submit an approved Independent Study Project application, available online. Independent Study Project --- Independent study projects, supervised by faculty, are available to graduate business students in good academic standing. To select a project, students should consult the appropriate professor about the nature of the project and the number of credit hours the work would earn. Students earn one to three credit hours per project and may elect only one study project in a term. Graduate business students should consult their program bulletins for information regarding total number of projects and credits that can be applied to their degree. To register for a project students must submit an approved Independent Study Project application, available online. Introduction to Microfinance --- Microfinance provides financial services to the poor, including credit, savings, and insurance. The field is undergoing a period of transition as microfinance institutions begin to seek money from capital markets. This course will explore how microfinance institutions are organized, how they raise money and are managed, and emerging trends that are shaping the field, all with an eye towards understanding the interplay between business models and poverty alleviation. This course stresses the concepts and skills needed to give effective oral presentations in professional settings. The course is guided by a theoretical framework that emphasizes strategic communication choices, expansion of communication styles, and adaptation to others within communication contexts. This course requires students to give professional business presentations in each of the four quadrants of management communication. In the course of doing these presentations, students develop outlines, create speaking notes, adapt content, and design supplementary materials. Students also practice question management and impromptu speaking. By the end of the course, students will be able to design, develop, and deliver management presentations that employ a variety of audience-centered strategies.